This incredible poster presents a tremendous amount of information in an easily understandable design. 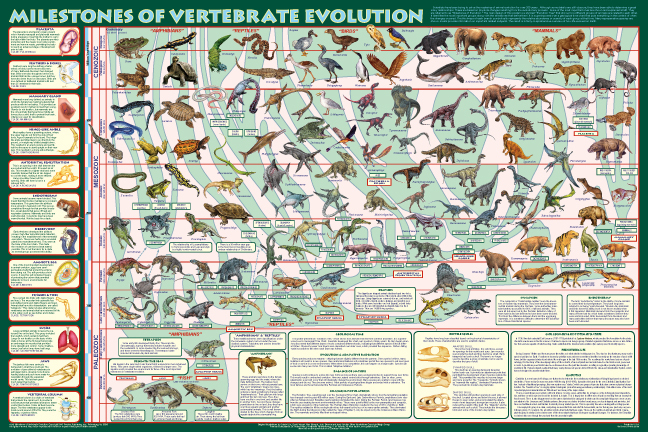 Along the left edge, the major milestones (physical developments) in vertebrate evolution are shown and described. The main design is an �Evolution Tree� superimposed over a geological time chart. The milestones are marked on it to show the resulting animal clades. The beginning and end of each branch shows when they lived; the thickness of the branch indicates their relative abundance or scarcity during each geological era. 119 species are shown, all in the proper era. This makes it easy to determine which animals lived at the same time. Interesting insets explain what the poster shows. The amniotic egg was one of the most important developments in vertebrate evolution. Eggs have a semi-permeable shell that protects the embryo from drying out. The yolk provides a food source. It was this self-contained means of protecting and feeding the unborn that permitted tetrapods (the first land animals) to live in environments far from water. Amniotes are a major clade. It includes all reptiles, mammals and birds.